This twin trunk thuja has progressed well since it was collected in Spring 2013. It was styled in the summer for the first time. While the foliage is still quite immature and lacking density, I am happy with where the image is going and it is becoming hard to imagine this tree without the lovely pot by Erick Križovenský’. 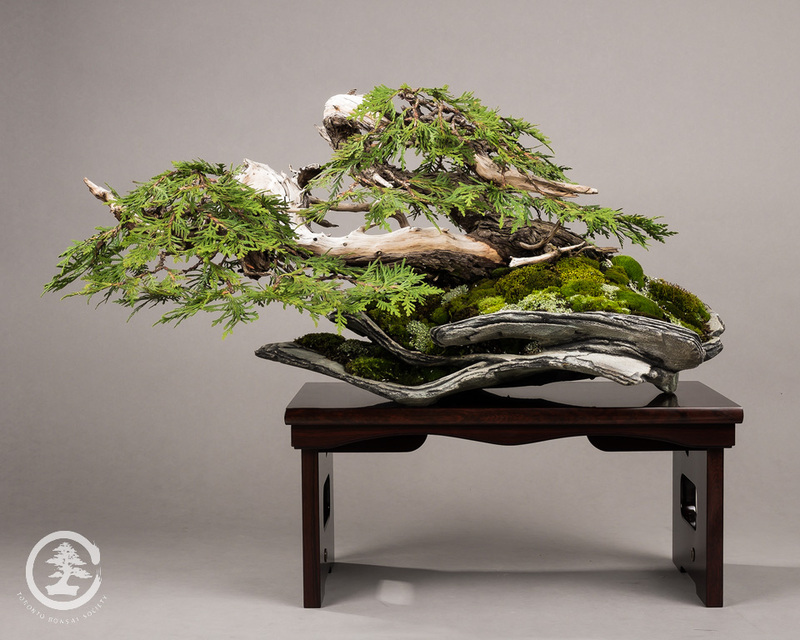 It was shown for the first time last weekend at the Toronto Bonsai Society Fall Show and Sale. The entire show was photographed by one of our members Mike Pochwat, who is a professional photographer. When the full album is available, I will share the link here. We are extremely fortunate to have such a talented photographer in our show, and that he was generous enough to take his time to photograph our trees. Meeting great people like this is just one of the many reasons why I always encourage bonsai enthusiasts to join a local club. Happy autumn to everyone! A busy time of year for us cold-climate bonsai nuts. This entry was posted on October 23, 2015. It was filed under Exhibition, Pots, Yamadori and was tagged with Atelier Bonsai Element, Bonsai, Canada, Erik Križovenský, Toronto, yamadori.